I'm glad it's summer time at least we can wear sandals without socks. Since our feet are expose during summer we need to take good care of our feet. According to the sayings, "live life healthy, live life safely". So, here's some health tips and the best way to care our feet. 1. First you need to cleanse feet daily with a mild cleanser. Gently and completely dry your skin, including between the toes. 2. Always remember to moisturize the feet with the cream containing urea, paying special attention to dry areas. 3. 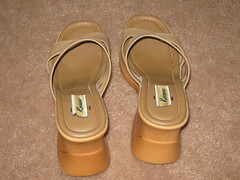 Wear comfortable sandal during summer. If needed wear socks that fit properly. Avoid socks that have seems or tight elastic tops. 4. If necessary use a mirror to inspect the bottoms of your feet and check between your toes. 5. Test bath or shower water with your elbow before entering. That's all for now, God bless you all and happy weekend.